So today I'm here to give you my favourites from the month of July so let's get into the stuff I've been loving both beauty and random so let's get into this. This month I haven't really been loving wearing too much make-up as we've been having a mini heat wave in the UK so let's say it doesn't stay on my skin when the weather is like that so I decided to stick to a more simple and natural make-up base which I always seem to enjoy wearing but I do love a full face of make-up. 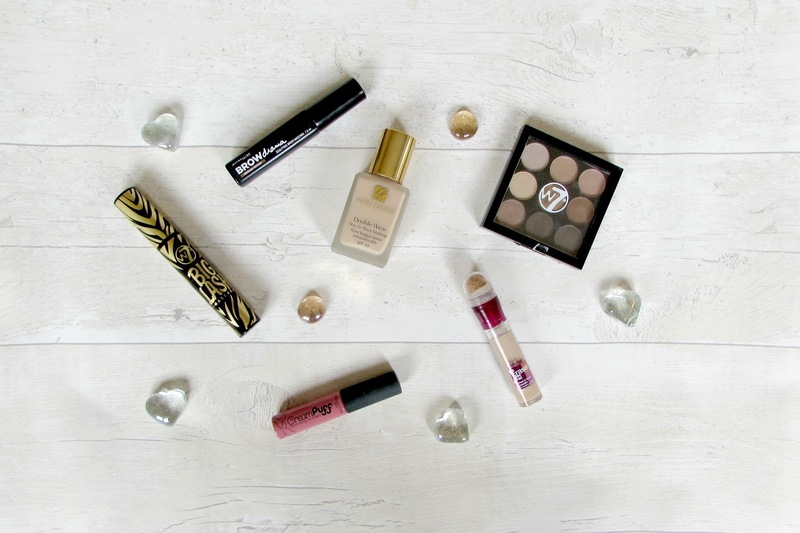 These are the main products I've loved using in the month of July and I've fallen in love with a lot of them. The first product is Estee Lauder Double Wear Foundation this is one of my holy grail foundations but I fell out of love recently but I've needed a more full coverage foundation with the weather been warmer as I still love a full face of make-up when it's summer as I'm still not happy with my skin but I have just fell back in love with this how this makes my skin look and how long it lasts on my skin. The next product I've loved this month is Maybelline Brow Drama which I picked up in June and I just love applying this over my brows to make them stay put all day and it definitely does that I love it. The next product is W7 Eyeshadow Palette which I picked up from Ebay and I just love these shades as they are mainly shimmer but they are all gold and brown shades and they stay put all day so I really love how inexpensive this palette is. The next product is Maybelline Eraser Eye Concealer which everyone adores so I picked it up and I also have fallen in love with this it applies so creamy and brightens my eyes so much and I love applying this on a morning now. The next product is Collection Cream Puff I've had this in my collection for so long and picked it up this month to realise I adore this shade on me so I've just been living in this shade on my lips. The final product of this month is W7 Big Lash Mascara this used to be my favourite mascara when I first started wearing make-up and well I still adore it now so I'm definitely glad I picked it up. It makes my lashes look so full and long I just love it. Suits- I started watching this ages ago and then stopped for some reason but I decided to start watching it again and I'm hooked. My Netflix is definitely getting used everyday now and I'm really enjoying it so I definitely recommend you watching it. Brief Encounters- This show started on TV this month I'm pretty sure but it's mainly based around the 80's and the girls who started the Ann Summers parties etc and I'm just loving it as I love anything based in the past as I find it interesting but I just find the story line and the characters so interesting so I'm loving Monday evenings. Perfect Strangers by Jonas Blue- This song just screams summer whenever I listen to it and I just end up in such a good mood when I've listened to it so I'm glad I found this song this month. Grass Ain't Greener by Chris Brown- I love this song, Chris Brown has always been one of my favourite male artists so I've been listening to this song on repeat and I'm loving it. Cold Water by Major Lazer- I heard this song on the radio and I wasn't too keen of it but then it's grown on me now and I love it and keep it on repeat, Justin Bieber also features on this and he just adds to how much I love the song. What's your favourites of July?